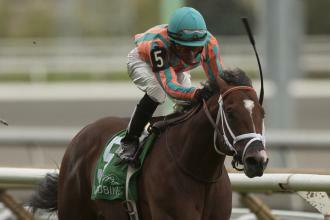 Conquest Typhoon graduated in style on Saturday at Woodbine in the Grade 2 Summer, giving Conquest Stable, trainer Mark Casse, and jockey Patrick Husbands a sweep of the two Breeders’ Cup Win and You’re In stakes for 2-year-olds on the card. Conquest Typhoon, ridden by Patrick Husbands, earns a berth in the Breeders' Cup Juvenile Turf by winning the Summer Stakes. Morning-line favorite Conquest Tsunami, who was to have been ridden by Corey Nakatani, was scratched about an hour before the Summer due to the giving ground on the turf course, according to owner Ernie Semersky. Conquest Typhoon raced wide on the turn in fourth, while Samuel Dechamplain set moderate fractions in the one-mile route. Conquest Typhoon hit the front nearing the eighth pole before drawing off a 4 1/4--length tally, in 1:41.10 over the good going. Samuel Dechamplain held on for second by a nose over U S Marshal. Second choice Imperial Dream and favored Saratoga Dreamer finished seventh and eighth, respectively, in the eight-horse field. Conquest Typhoon paid $8.80, and earned $144,000 of the $234,800 purse.